Thanks to all of Knit the Bridge’s many participants and supporters! Knit the Bridge was no ordinary public art project. Beyond being the largest yarn bomb in the world ever, Knit the Bridge cultivated a sense of community and was about collaboration, imagination, working together, and most of all, building trust. Knit the Bridge grew from the ground up, one stitch at a time, hundreds of stitchers stitching together. Each individual stitcher had confidence that thousands of others would hold up their end of the deal. Knitting groups at libraries, in classrooms, and in yarn shops believed that there were other groups out there, committed to the same cause. 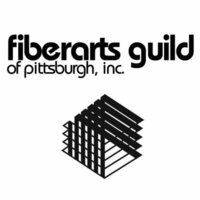 The Fiberarts Guild took the lead because it had trust in its membership’s ability to take on an extremely ambitious undertaking while also putting on a pretty awesome Fiberart International 2013. All of KtB’s many volunteers trusted that Allegheny County officials, staff, legal team, and public works department to sanction the installation – something for which there was no precedent. 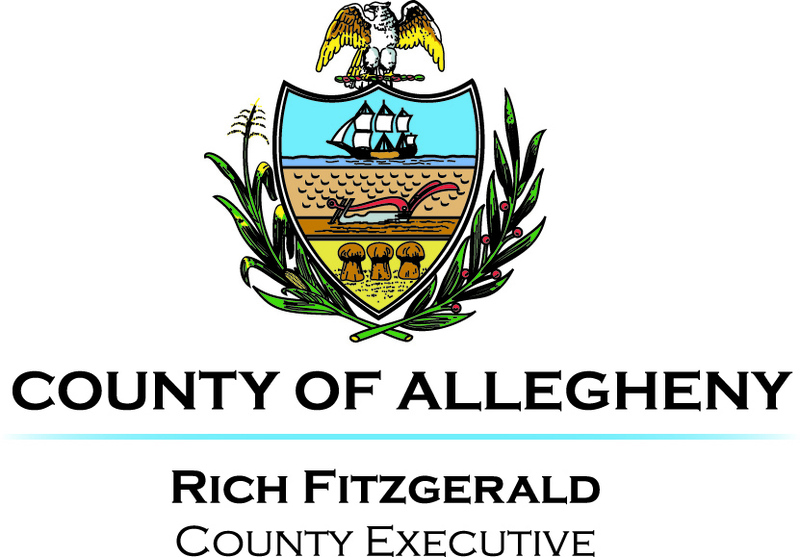 Allegheny County trusted Knit the Bridge to come up with a solid plan, do our homework, follow through, and find partners to help carry the project forward. 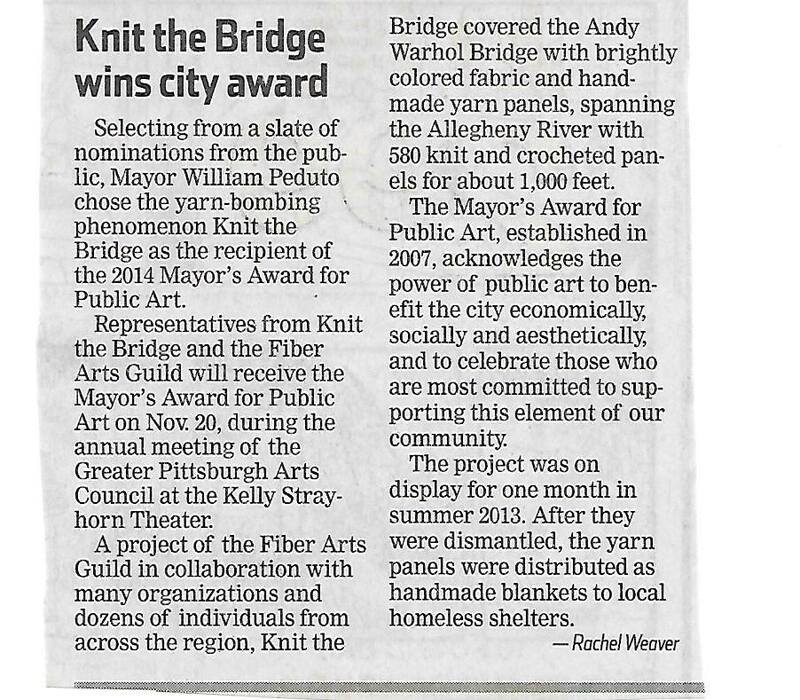 And when Knit the Bridge needed them, Pittsburgh Center for the Arts, local foundations, and a fabulous legal advisor also trusted in this project and stepped forward to help. Trust, cooperation, sharing, recognizing our interdependence, and relying on the ability, knowledge, and competence of others are all things Knit the Bridge taught me. 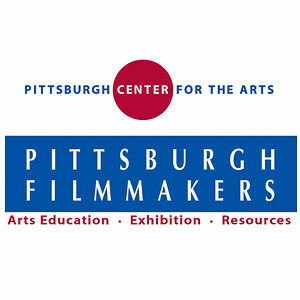 In the face of our many divisions, I hope that this legacy of collaboration and humility is what you, Pittsburgh’s art world will remember for years to come. 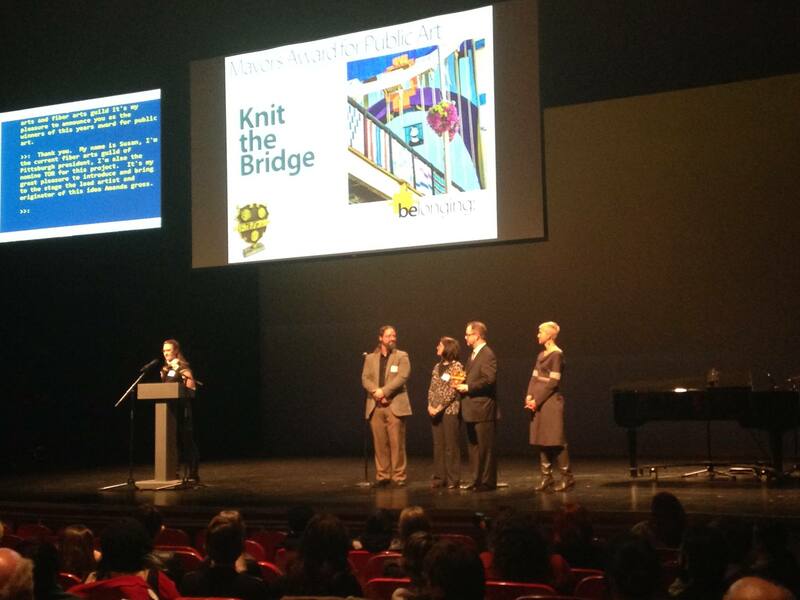 Thank you again to everyone who made Knit the Bridge happen. 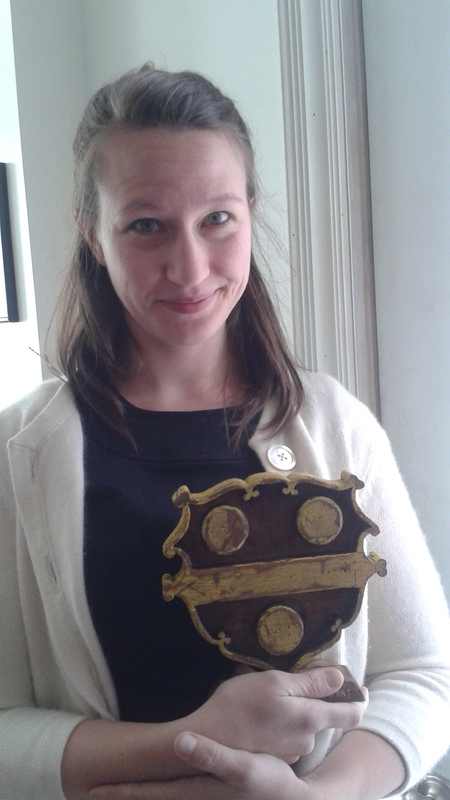 Especially thanks to my co-director, Penny Mateer and members of the core team who weren’t able to be present today. And thank you to GPAC and Mayor Peduto for this award. One of the best things I ever participated in. Thanks Amanda and your work crew.